We were planning to spend a few weeks on the Amalfi coast. This was going to be part vacation and part work as Michele was doing research for a new book. I had not planned to visit any wineries on this trip, but as we were about to leave I received an e-mail from Tom Hyland, a friend and fellow wine writer. He also was going to be in Campania, but unfortunately we would miss him by two days. Tom mentioned to Illaria Petitto, whose family owns the Donna Chiara Winery that I was going to be in the area. I had met Illaria and tasted the Donna Chiara wines in New York and I liked them very much. Illaria invited us to visit the winery, less than hour’s drive from Sorrento where I was staying. She offered to send a car for us, introduce me to the winemaker, and her mother would prepare lunch for us. It was an offer that I could not refuse. Ilaria showed us around the winery, which is located in Montefalcione in the Irpinia area near Avellino. The modern building is set on a hilltop in an area of rolling hills. Winemaker Angelo Valentino arrived and I told him that the Donna Chiara whites were some of the best I have tasted from this area. He said that all of them are made in the same way. The juice was free run and fermented and aged in stainless steel. Malolactic fermentation does not take place. 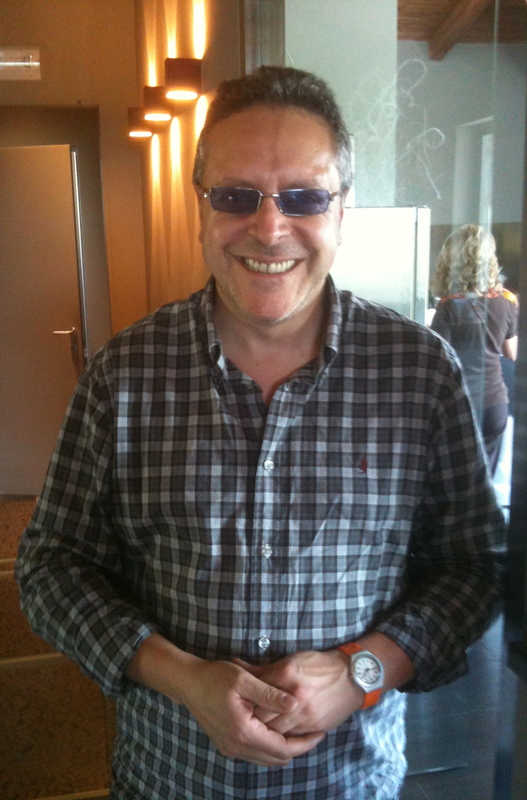 Angelo believes that most white wines are consumed too young. He feels that they should be at least 3 years old because in the first year or so all you get are the aromas and taste of the fermentation process. Ilaria’s mother Chiara Petitto joined us and told us that the winery was dedicated to her grandmother Chiara, a noble woman born in 1883. 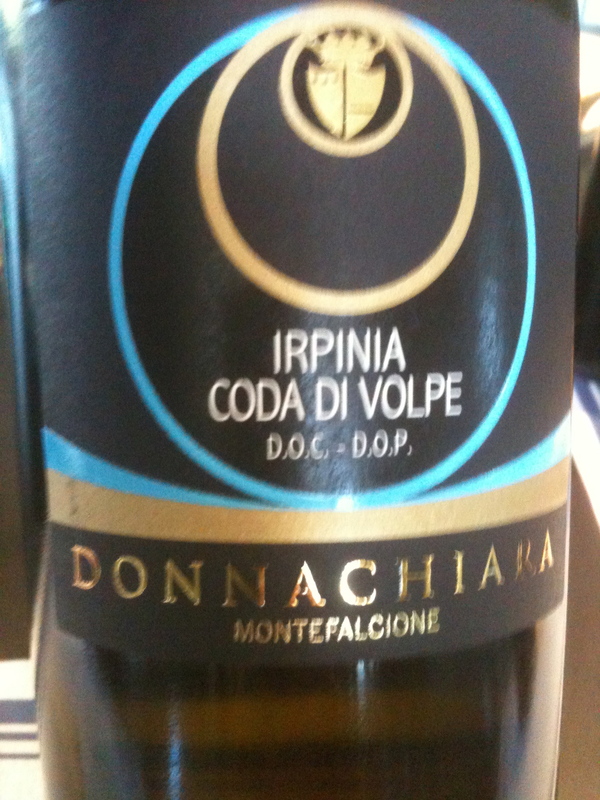 Coda di Volpe DOC- DOP 2011 made from 100% Coda di Volpe. The wine had been bottled just 8 days before. 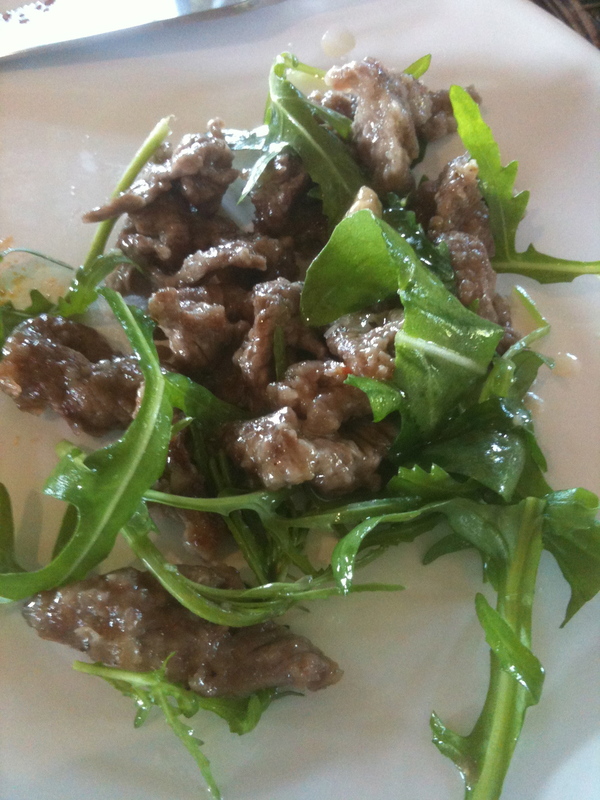 Angelo said that this is a different variety of Coda di Volpe than is used in other areas and has more body. The soil is mostly clay and the training system is Guyot. There are 2,500 plants per hectare. This is a wine with good structure, hints of citrus and herbs. There is good acidity, nice minerality, long finish and pleasing aftertaste. 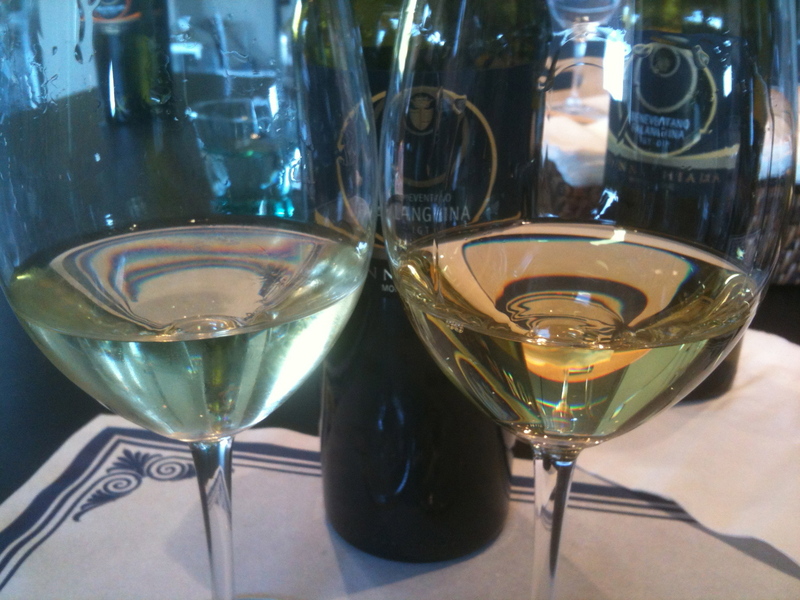 We tasted two Beneventano Falanghina IGTside by side: The 2011 and the 2009. Both are made from 100% Falanghina. The grapes come from vineyards that they rent in Benevento. The soil is chalky clay, there are 2,500 vines per hectare and the training system is Guyot. The grapes were picked at the height of maturity. Angelo wanted us to taste the wines side-by-side so we could see how the wine has developed with a few years of bottle age. He said that they were very good vintages. 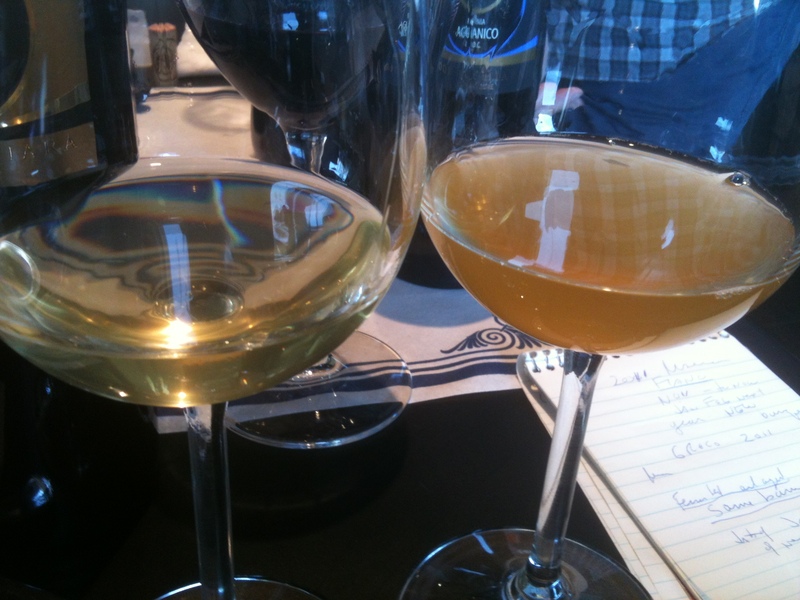 The color of the wine had changed and so did the flavors and aromas. The 2009 was more developed, its aromas and flavors of citrus fruit with hints of apricot and pear were riper and easier to identify. I had to agree with Angelo, I would rather drink the 2009. Greco di Tufo 2011 DOCG 100% Greco di Tufo The soil is Tuffaceous and the training system is Guyot. There are 3,300 plants per hectare and the harvest takes place during the second week of October. Angelo said that the grapes come from highly rated vineyards. This is a wine that needs at least 5 or 6 years of bottle age before it is ready to drink, he remarked. I mentioned that about ten years ago I was given 2 cases of Greco and Fiano that were more than 20 years old. Most were in very good condition. At a wine class I once gave I opened a 1983 Greco and a 2003 Greco from the same producer and it was difficult to tell which was the older wine! We tasted 3 vintages of the Fiano di Avelliano DOCG 2009, 2010 and 2011. 100% Fiano di Avelliano. The soil is chalky clay and the training system is Guyot. There are 4.400 vines per hectare and the harvest takes place during the second week of October. One could see the development of the wines from the different vintages. This was a wine with good structure and body. There were floral notes, aromas as flavors of citrus fruits and good acidity. There was a hint of smoke and it really become noticeable in the 2009. The current vintage of their white wines on the market is the 2009. We then tasted barrel samples of two wines, a Greco and Fiano, which they made for the first time. Ilaria said that her father Umberto had planted the Greco di Tufo grape in Torre le Nocella, which is not in the DOCG zone. He felt that this area would produce a Greco of great quality. It is a single vineyard (cru) and will be called Vigna Nascosta, which means hidden vineyard. The Fiano is a cru form a single vineyard in Montefalcione and will be called Esoterico. Angelo explained that both these wines would be different from their other white wines. Both of these will be fermented and aged in new barriques. The Fiano looked and tasted liked it had completed the fermentation process but the Greco looked and tasted like it had a ways to go. They were both barrel samples. The Donna Chiara wines are released later than other wineries, the current vintage being 2009. When I asked Angelo when these two new wines would be released his answer was, when they are ready. After the tasting, we enjoyed the wines with the excellent luncheon Chiara had prepared for us, including local cheeses, porcini ravioli with tomato sauce and baked orrecchette with mozzarella, and stracetti – strips of beef sautéed with arugula and lemon. Charles: I greatly enjoyed reading this. Sounds like you had a wonderful visit. The barrel samples sound very interesting. I didn’t get the chance to try these, so I’ll look for these wines on my next visit. It’s so nice to see someone as kind as Ilaria enjoy such success! Ciao Tom, Yes we had a wonderful visit and thank you for telling Ilaria that we were in the area,she is a very nice and kind person.